Looking for a way to streamline your CPR Training Classes without spending a fortune? Simulaids has developed the ideal manikin combination pack: The Sani 3/2. 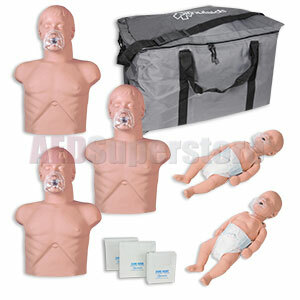 With 3 adult and 2 baby manikins, you can accomodate more students at once without breaking your budget. This is a great price for 5 manikins. Get 2 or more for even more coverage! Size 21" x 16" x 19"